This entry was tagged A Sword Into Darkness, Baen Books, cover critic, lousy book covers, Military science fiction, novel, Ravencon, science fiction convention, self publishing, Stealth Books. Bookmark the permalink. I think the cover is great, and even more impressive knowing you did it yourself! I liked the cover also no matter the critics. Great read too. Looking forward to your next one! Thanks, Paul! I’m glad folks are enjoying it. 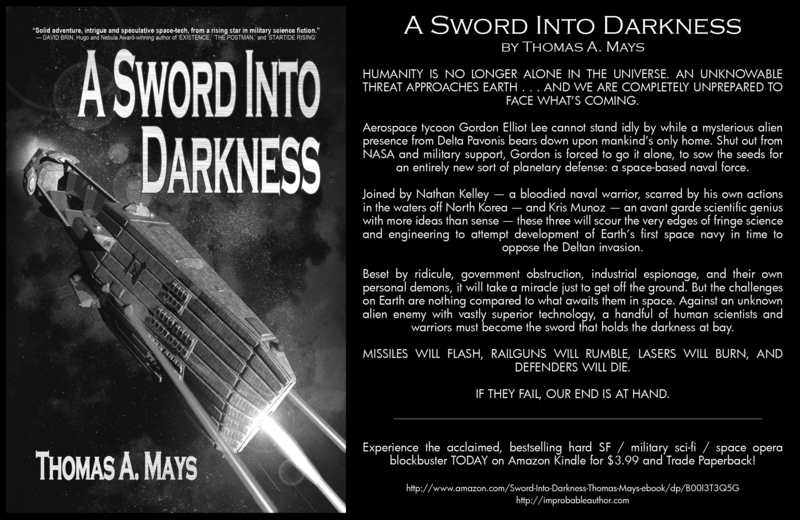 Perhaps I may be beginning the next thing folks will enjoy . . . .
A Sword Into Darkness is ASID. What could LITL and ASBS correspond to? Anyway, commenting on this post because of your mention of the Baen Barflies. I’ve been a Baen reader for many years, and I think you’ll fit right in with us (although I won’t be at the con).